APHA Barrel Racing Calendar- List of upcoming barrel racing events, futurities and more. 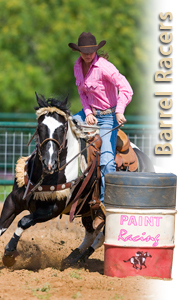 Leaders Lists- A listing of the leading Paint barrel horses. World Show Qualifying- Regional Clubs are the heart of the APHA, and support of these grassroots clubs is vital to the growth of the Paint Horse industry. APHA’s qualifying is strictly participation-based, and on the horse only. World Show- For more information on speed events offered at the APHA World Championship Paint Horse show, visit aphaworldshow.com. Paint Alternative Competition- For more information on various ways to get involved with the Paint Alternative Competition (PAC) and for a listing of approved events, visit apha.com/pac.